I've been officially back 'in-training' for a week now for next year's 70.3s, and on a broader scope the 140.6 full courses close to the end of next year. 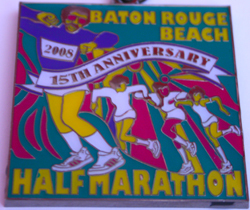 My tri coach frowned on it, but I strayed a bit from my training and ran my last race of the year on Saturday morning, the Baton Rouge beach half-marathon. He made me set some goals for the race, which if you know me, I was more than happy to do. - Goal 1 would be to run the entire race without stopping and walking. - Goal 2 would be to break 2 hours. - Goal 3 would be to not have any gastric funhouse events. I started out with a brisk 8:45 pace keeping my heart-rate in check at 125 bpm. Since I was going to treat this as a training race to some extent I never wanted to break the 135bpm threshold throughout the race. That never was a problem. The weather was a bit cold to start the race at around 45 degrees but it warmed up quickly as I reached the first mile marker. I really need to re-calibrate my watch because it's still off by around 60 feet. It may not seem like much but that 60 feet adds up to half a mile or more over a long run. The course meandered through the neighborhoods that surround the campus of L.S.U. before turning back and heading around Death Valley (Tiger Stadium) and onto the L.S.U. campus. I was very familiar with most of the course because I trained for my marathon in January on much of the same route. So I emerged from the bathroom after 20 minutes, thanked the kind lady, and ran back out onto the course. So goal 2 and 3 were officially done. I had to stop again at a port-o-joy around mile 10 for some more of the gastric funhouse and then finished the race in just under 2:25.00. Oh well. 1 outta 3 goals would have to do. So that's it for this year. It's been one of the most amazing years of my life and I've enjoyed sharing it with you guys. I'm concentrating on only a handful of "A" races next year with most of them being long course tris. I've got some pretty lofty goals to meet and with a ton of training I know that I will have no problems meeting them.